But for lunches, lately I’d been finding that my usual method of flying by the seat of my pants was often just leaving me eating the same things, and it was getting super boring. Plus, nowadays I need to make sure I have healthy and fast/already prepped options on hand to feed Riese! Enter: getting on board with a bit of ingredient prep over the weekend so that throwing together something interesting for lunch doesn’t take half my day. 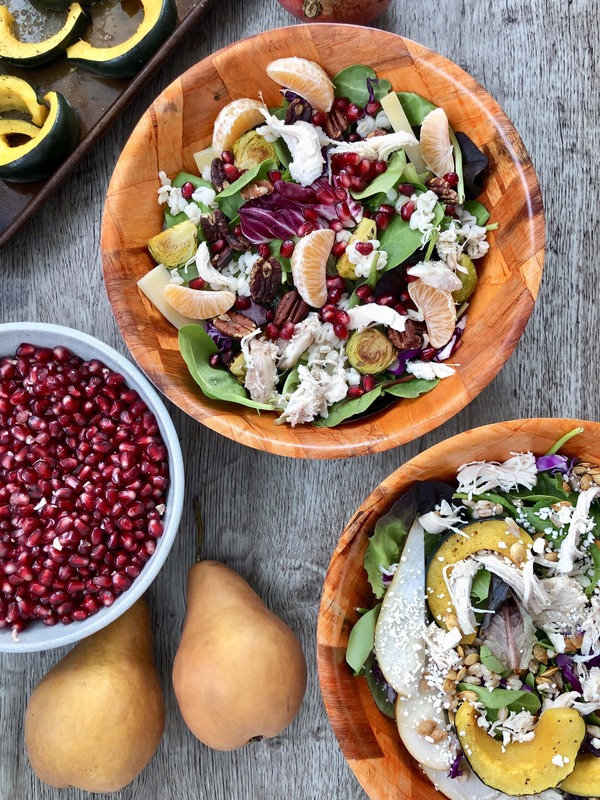 Thanks to a little pre-prep, I’ve been loving hearty, winter-y grain salad bowls recently. Anyone else? I’ve never been a great meal prep-er, so rather than trying to do full meal prep/planning for lunches in a way that feels overly complicated or structured, I’ve instead been trying to focus on doing ingredient prep. So, not prep in the sense that I’m preparing/making a full meal, but rather just prepping specific ingredients, so that I have them on hand and can mix and match as I see fit. 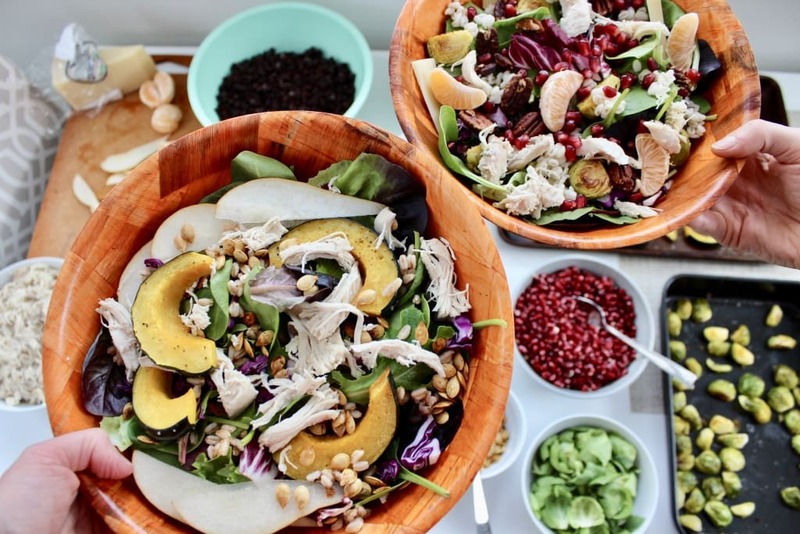 I love the ingredient prepping approach because you’re not just eating the same meal all week – you have a bunch of ingredients prepped and then you can switch them up and turn them into totally different creations throughout the week so you don’t get bored. It also feels less overwhelming to me to prep a few ingredients vs. making full meals ahead of time (although I am going to a meal prep party this weekend that a friend is hosting – excited to report back on that!). I’m not planning to do all of this every weekend, but it really inspired me and reminded me that prepping a few things ahead doesn’t have to be an hours-long ordeal. 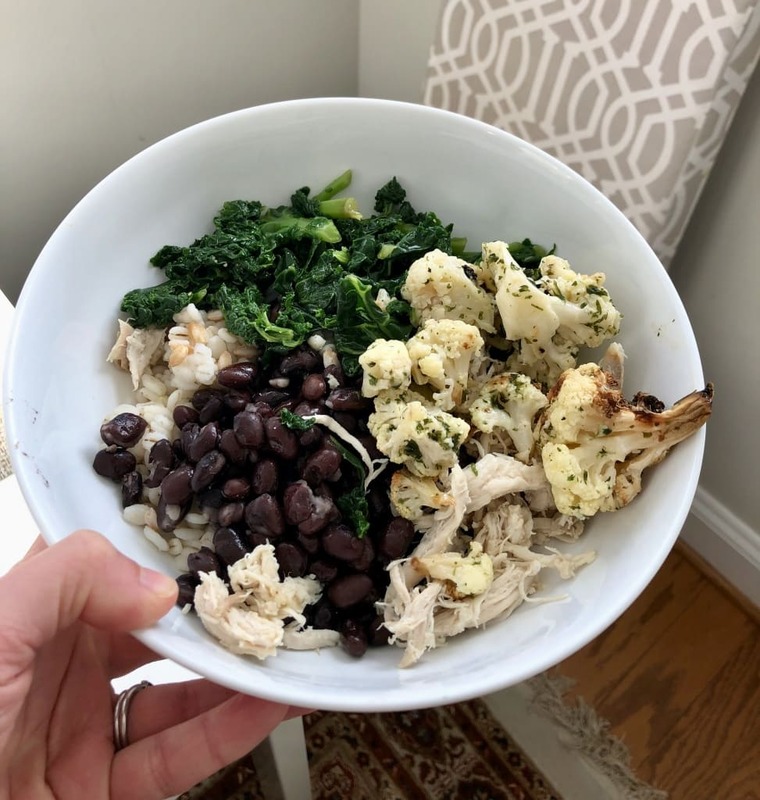 Through our prepping session a few weeks ago, and subsequent solo weekend prep sessions, I’ve determined there are a few main things you can prep ahead of time/keep on hand that make it easy to throw meals together in a jiffy. Give it a shot, and feel free to just pick a couple of these to prep – don’t feel you have to do everything! Whole grains. I use 90 second brown rice a lot, but it’s nice to mix it up and have different grains on hand. 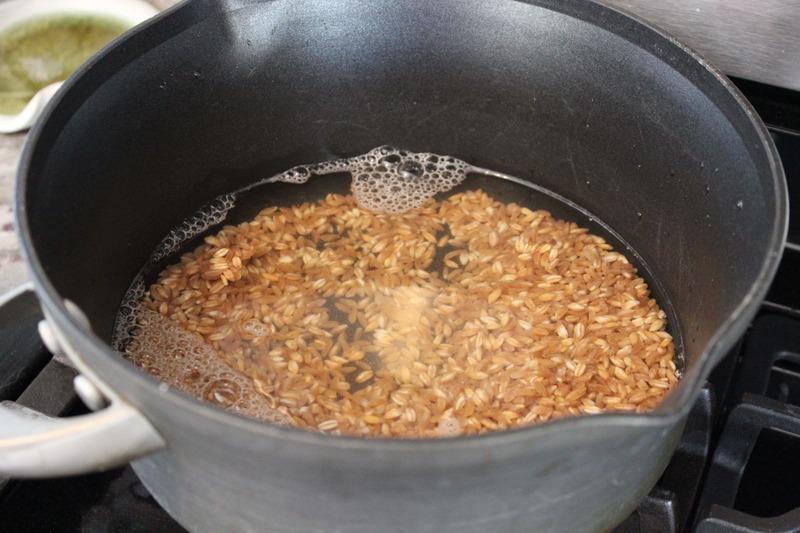 Two of my faves are farro and barley – love the chew! – but other grains that I love prepping ahead to have on hand for the week are quinoa, orzo, etc. 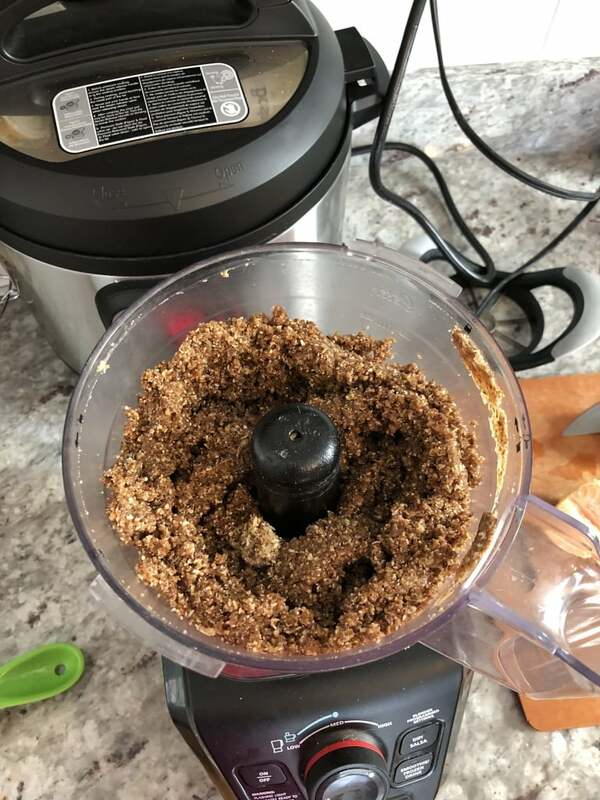 I usually prep these on the stove, although I know you can do brown rice quickly in the Instant Pot, too – that’s on my list to try soon! Having whole grains on hand to serve under a protein and veg at dinner, or as a component of a grain bowl, is so convenient. Riese likes snacking on plain grains, too, which is nice and easy! 3) Toasted nuts + seeds. This is an optional step, but toasting nuts gives them a TON of flavor and they are absolutely delicious as an addition to salads, yogurt bowls, oatmeal, toast, etc. 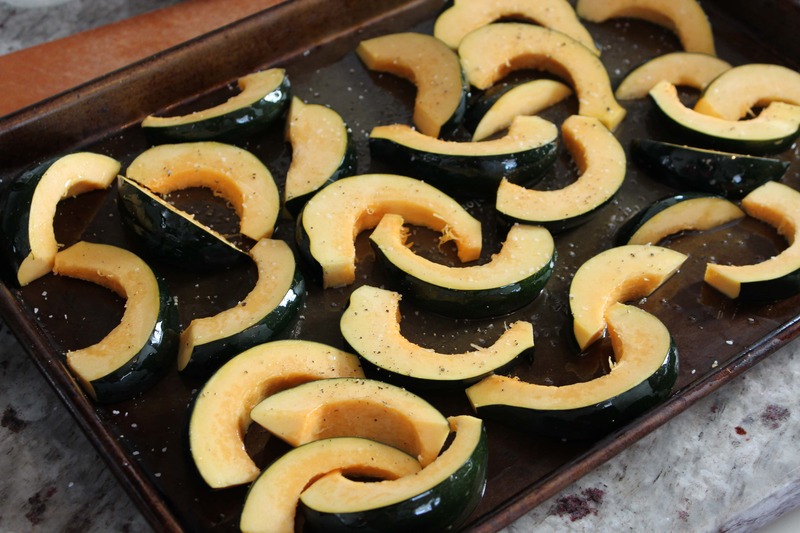 Just toss them on a dry pan and roast at 300 for about 5 to 10 minutes – check and stir them a couple times to make sure they don’t burn. Sarah and I toasted pecans, slivered almonds, and sunflower seeds, but you can get creative here as well! I’m still making my way through these – you can make a ton and store them in an airtight container. They last for quite awhile! 4) Roasted veggies. Having pre-roasted veggies on hand is awesome for throwing together salads, or as a side for dinner. Some of my faves: acorn squash, sweet potato, white potato, brussels sprouts, cauliflower, and broccoli. 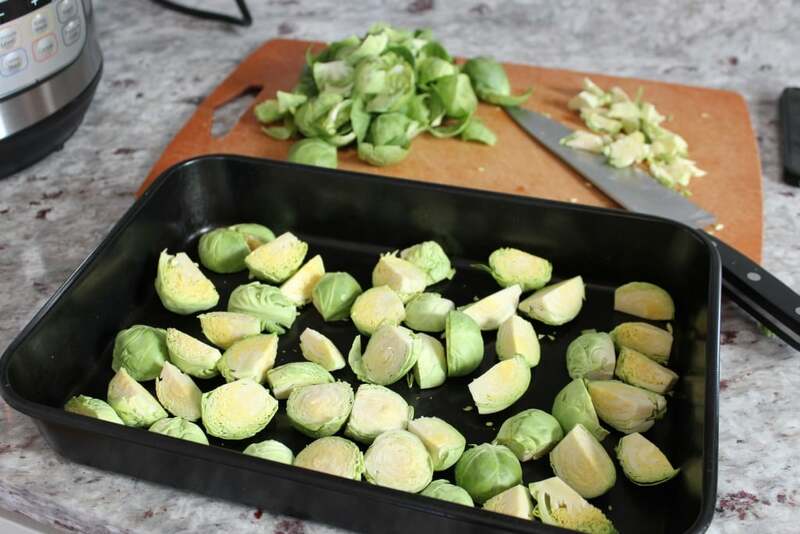 Hot tip: to make brussels sprouts less bitter, slice off the tough ends. I also usually slice them in half or quarters to get more delicious browned sides! If any of the leaves fall off, you can save them as salad greens. 5) A protein/meat. Yes, I know beans have protein, too! But I love having pre-cooked shredded chicken on hand to also throw into salads, soups, tacos, sandwiches, etc., and to give to Riese. To make this step really easy, you can always just pick up a rotisserie chicken, or you can cook chicken in the oven or in the Instant Pot. 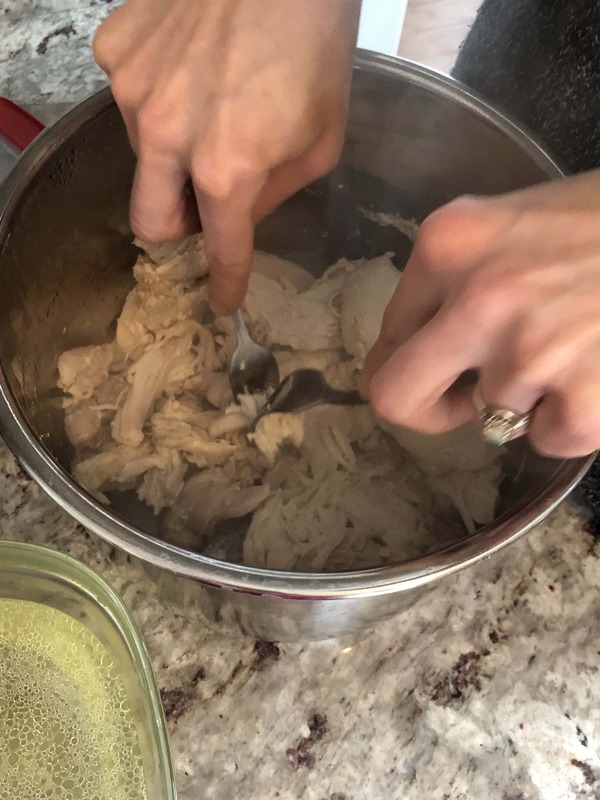 For the instant pot version, just throw raw chicken breasts or thighs into the Instant Pot, cover them with water and sprinkle in some salt, and pressure cook on high for 15 minutes. Tender and shreddable – perfect! 6) Snacks. Okay, so this isn’t part of lunch prep, but I usually figure that while I’m in the kitchen getting things dirty anyway, and while waiting for other things to cook, I might as well throw together some snack balls for the week, too. 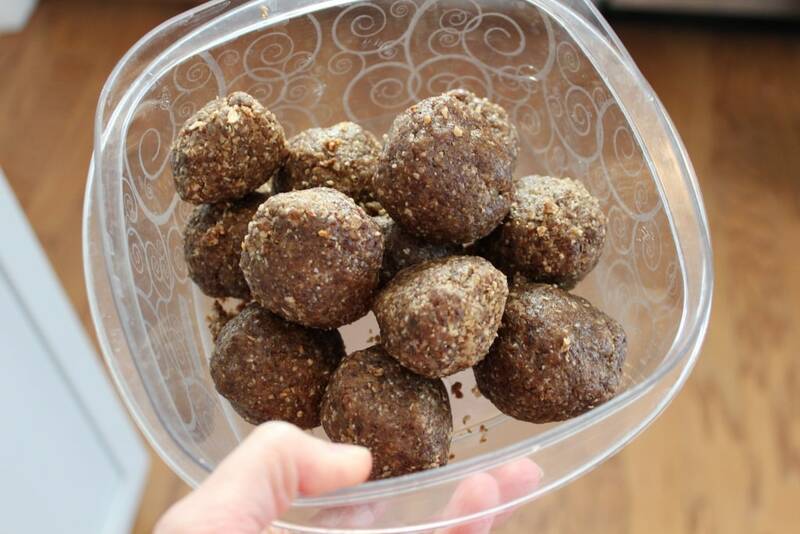 My Oatmeal Raisin Energy Bites are my fave because they are so easy – these were ready in 5 minutes flat. 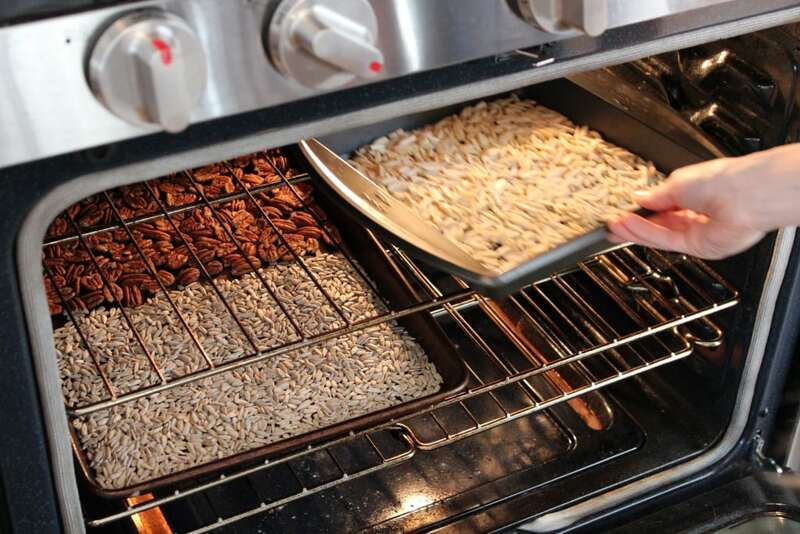 You can mix up the ingredients, too – try different nuts and seeds and different dried fruit if you like! 7) Pre-cut raw veggies + fruit. I will often pre-cut veggies like peppers, carrots, celery, etc. 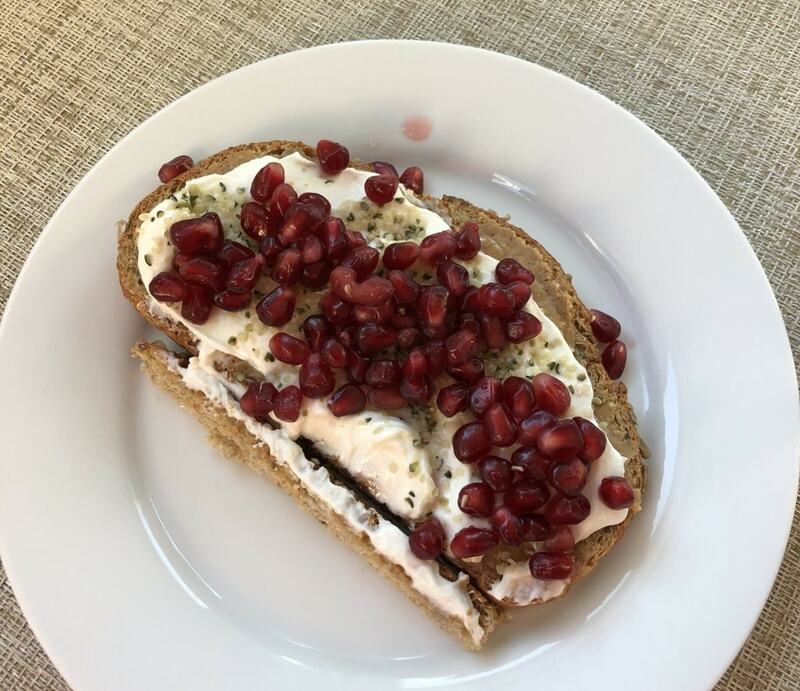 so I have them on hand to easily toss into salads or to snack on as-is, and sometimes I’ll prep ahead fruit, too, like pomegranate arils (so good on top of toast). Cheers to having the ingredients on hand to throw together all sorts of different creations! My lunches recently have been way more delicious. 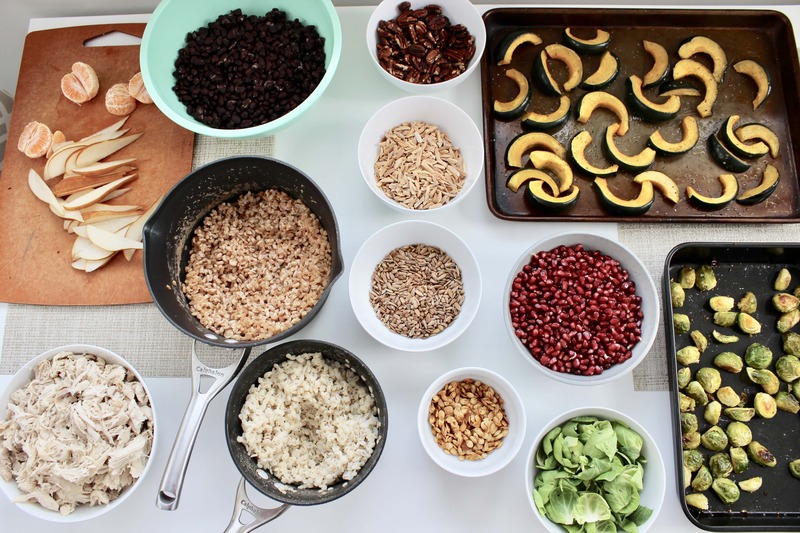 What are your favorite ingredients to prep ahead of time to make throwing together meals/snacks during the week easier? This is what I do every Sunday as it makes lunches and dinners so much easier. Sometimes I’ll make a full meal to reheat (usually pasta bakes, soup or refried lasagna, etc) but many times I’ll do what I did this week. Lunch was mustard roasted salmon with farro and sauteed spinach. Everything made separately and placed in their own container. This way if I decided to add something/switch it up I could. Another lunch of noodles & veggies with peanut sauce – noodles were cooked, veggies and nuts are separate to stay crunchy and peanut sauce is separate to add right before eating. Dinner is mini meatloafs, baked fries and roasted brussel sprouts. All baked and packed separately to be reheated together. Once you find the routine that works for you, for me it’s a couple of hours on Sunday, you’ll never look back. All of that sounds delicious! Good for you for finding a routine that works for you! Thanks for these tips! How do you determine how much to make? I find that I usually make too much and can’t finish things before they go bad, or I don’t make enough and it’s Wednesday and I’ve gone through all my prepped stuff for the week. Any advice? This is hard, I agree! I don’t really have any advice honestly besides some trial and error. I usually err on the side of making too little because I know stuff comes up, and Matt doesn’t love leftovers so I’m the only one eating stuff like this usually. Wow! This is a really a great idea. Thanks for sharing your experience. I love this approach and use it for our meal prep too! I try to cook in bulk, so like you, I will roast a pan of vegetables, cook a pot of grains, and then bake salmon/chicken/etc. I bought an organic rotisserie chicken with a coupon and went ahead and removed the skin, broke it down, and froze it for quick meals. We always keep canned beans on hand for “power bowls”. I want to make a few more snacks for us to keep things interesting. I like the idea of keeping protein, carbs, vegetables separately so that they can be used in a variety of dishes throughout the week. Thank you for this post! Love the idea to break down the rotisserie chicken all at once vs. having to do it every time you want to eat some of it! I tend to prep some roasted veggies and even some sauces for adding to salads or meats (e.g. – will prep a curry sauce to cook chicken or tofu in later). I also will prep overnight oatmeal – usually do 2 or 3 on the weekend to have for busy mornings during the week. I like the idea of prepping the toasted nuts! I always want those after I’ve already made whatever I’m eating for lunch or dinner, so usually am too lazy by that point to get all the stuff out. That’s so smart to prep sauce ahead of time!